Your One-Day Schedule For Hollywood Studios | Planning A Walt Disney World Trip? Planning A Walt Disney World Trip? Starting your day at Disney’s Hollywood Studio’s when you first enter the park will put you directly on Hollywood Boulevard. Mickey’s giant sorcerer’s hat will be a prominent view for you as you decide on your next direction. Mickey’s sorcerer’s hat is the perfect place for photo op’s in the morning as it is the place Disney characters tend to congregate early in the morning when the day is fresh, usually around 9 AM or so. On your way to the hat, you can do some light browsing in some of the many shops along the way. While you are there, just behind Mickey’s hat is The Great Movie ride, which will take you through some great movie history of major American movies like Tarzan and The Wizard Of OZ. Afterwards, you can mosey off to the right, onto Sunset Blvd and check out two the the major MGM attractions there, which are geared to the thrill seekers. First up, the not to be missed Tower of Terror, which is one of the major feature attractions of MGM studios. Experience a scary thrill dropping 13 flights in an elevator and then go back and do it again! After that you can hop on the Rockin’ Roller Coaster and rock out to Aerosmith while barreling along the track going from 0-60 mph in no time flat. If you have kiddies along with you, you can check out the Beauty And The Beast- Live On Stage, and then head on over to Rosie’s All American Cafe for a quick lunch time snack. If that doesn’t appeal, there are several other restaurants all near by with varied cuisine. After lunch, head on over to the Animation Courtyard. 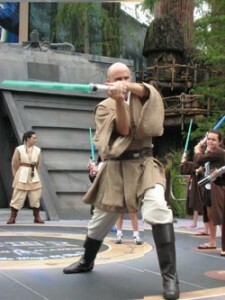 There you can hop on the Star Tour’s simulator for a fun excursion into all the characters of Star Wars. After that, ramp up the excitement with the Indiana Jones Stunt Spectacular, a live stage show sure to entertain both you and the little one’s. If you arrive early you can even get the chance to volunteer as an extra during the show! Once done there, you can head over to The Streets Of America, where you will find 3 more of Hollywood Studio’s most popular attractions. Muppet Vision 3-D, Honey, I Shrunk The Kids Movie Set Adventure, and The Lights, Motors, Action Extreme Stunt Show. At Muppet Vision 3-D, you get to watch those adorable muppets literally pop out of the screen at you, and enjoy a bit of cool relief while you get a stitch in your side from laughter. The stunt show is pretty incredible as well as you get to see first hand how Hollywood movie car stunts are done. On the Honey I Shrunk The Kids Movie Set Adventure, you can let your kids loose in the huge playground and let them get an idea of what it REALLY means to be one of the ‘little people’. This is a great spot to grab some hilarious photo’s as well, so make sure to have the camera ready! Top it all off with some pizza from the Toy Story Pizza Planet Arcade, and then head over to the night time show Fantasmic. Here you will watch Mickey battle some familiar villains with pretty lasers, see dancing fountains, and other cool effects that will be the perfect ending to your Hollywood Studio’s day. Just remember to get there a bit early or you might not get a seat! This entry was posted on Tuesday, July 6th, 2010 at 2:08 pm and is filed under Things to See. You can follow any responses to this entry through the RSS 2.0 feed. You can leave a response, or trackback from your own site.